George Willis. Photo: Eric Brown. Kit Elliott and Ben Jackson scored the decisive goals which saw Darlington leave York Street with the points in an instantly-forgettable game, played out with an end-of-season feel. United were forced to put out an unusual-looking line-up as injury and illness left Craig Elliott with five unavailabilities. Leading scorers Nicky Walker and Gavin Allott plus defender Ryan Cresswell weren’t fit enough to play while Tom Clare and Jordan Slew - who were set to be the front two - both pulled out due to illness. 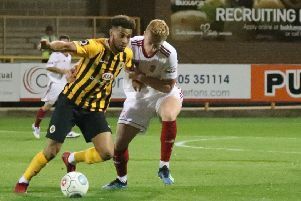 Andre Johnson was handed his first start since August 14 while Ben Middleton joined Ryan Qualter in defence after completing his two-match ban. The two sides have little left to play for and it showed as they went through the motions. But despite the lack of blood-and-thunder challenges and end-to-end action, both sides still created scoring opportunities. Jay Rollins twice forced saves from Quakers keeper Jake Turner, the latter seeing Terry Galbraith clear Jonathan Wafula’s follow-up off the line. Max Wright, enjoying some freedom down the right, also threatened the visitors’s goal but he and Johnson couldn’t find the target when afforded shooting opportunities. Boston may have created the more chances but it was the Quakers who made the most of theirs, George Willis forced into two important saves to deny Jordan Nicholson. Willis was at it again after the break as he forced away Stephen Thompson’s header and two Romal Palmer free kickcs. But two goals in as many minutes put Darlington firmly in the driving seat. Kit Elliott put his side ahead in the 58th-minute as he picked his spot from out wide in the penalty area, Ben Jackson’s thumping long-ranger doubling the advantage just seconds later. In between those two goals United had the chance to level as Johnson broke clear, but Turner blocked with his body. Cameron Hawkes was handed a late Boston debut as he replaced Brad Abbott, but by then the fans could barely muster a polite ripple of applause. In stoppage time Willis pulled off his best save of the day, blocking Harvey Saunders’s close-range volley with an outstretched boot. UNITED: Willis, Davies (Jackson 82), Smith, Thanoj, Middleton, Qualter, M. Wright, Abbott (Hawkes 78), Johnson (Wroe 68), Rollins, Wafula; Sub (not used): Parkin. DARLINGTON: Turner, Trotman, Jackson, Holness, Ainge, Galbraith, T. Elliott (Kneeshaw HT), Palmer, Thompson, Nicholson (K. Elliott HT), Henshall (Saunders HT); Subs (not used): Burn, Bascome. STAR MAN: George Willis - the skipper made some important saves before the Quakers struck.